Here is what I love about Autumn; it is beautiful whatever the weather. If it rains the red leaves glisten and your wellies are ready for jumping through puddles, if it is misty it gets the really still atmosphere that is utterly enchanting and if it is sunny the leaves crunch under your feet and the air is so clear it becomes refreshing. Last Saturday morning was one of those sunny Autumn mornings. I found myself sat on my garden steps in the sun with a lemon pastry swirl on my lap just enjoying the scenery. Our garden looked so inviting and I knew I was going to be doing some baking that afternoon that I half began putting a plan together of having an outdoor picnic with Rob later that afternoon. I would set up the picnic blanket and serve freshly baked cake and hot chocolate. We could wrap up in our thick jumpers and bring our books outside to read. I was even thinking of finding a way to set up a small fire! Well those day dreams had to be adapted because by the time my cake was out of the oven that afternoon the sunlight had deserted our garden! But then I remembered this pin I saw on Pinterest that always made me feel so cosy! Thick socks, breakfast food and beautiful floors. 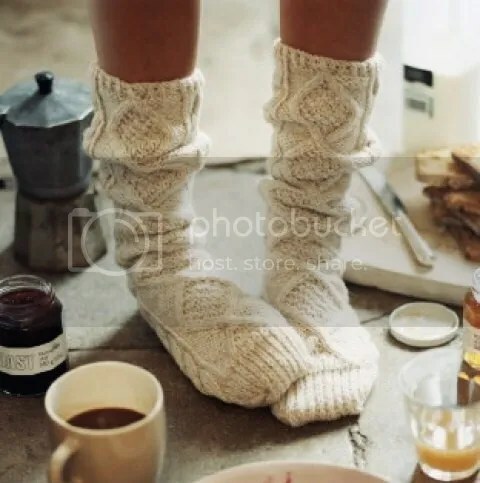 Well, it might be afternoon tea instead of breakfast and a picnic blanket instead of or a rustic floor but I thought I could recreate this kind of atmosphere; after all I do have white cable knit tights! 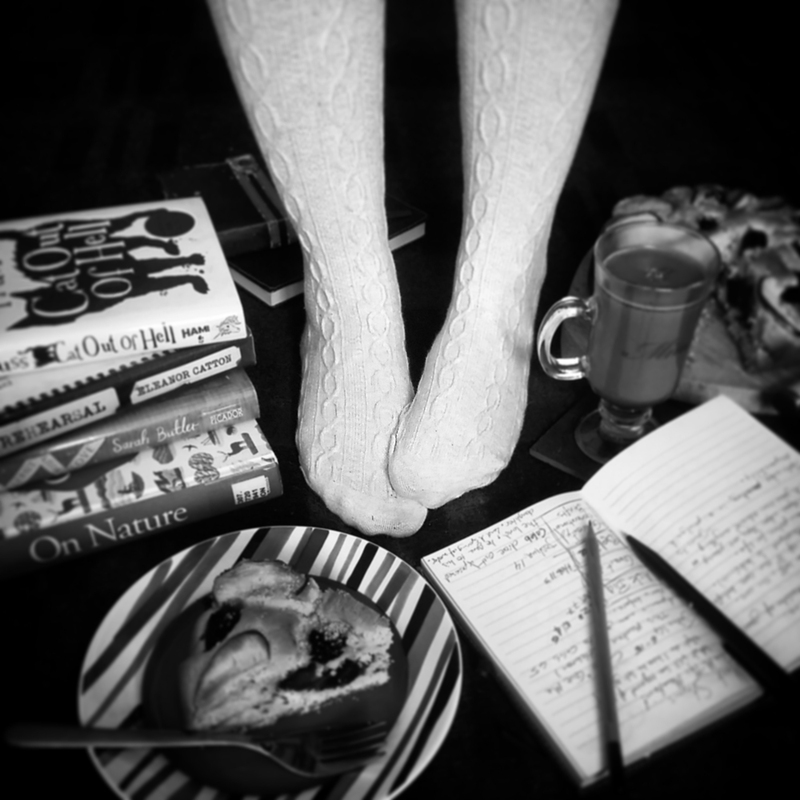 So I moved my Autumn picnic plans inside, I laid out the blanket, baked the cake and made up some hot chocolate. We gathered our books and notebooks together and just for good measure Rob and I recreated the original photo! And it is in black and white for extra arty points! I quite like the idea of having indoor picnics for colder weather! What would you have at your autumnal picnic? I have this friend called Becky. She is a mum, she started her own business in the middle of a recession and she makes the best cakes! Whatever your cake dream may be, I have yet to hear of an idea that Becky can’t turn in to a sugary reality. 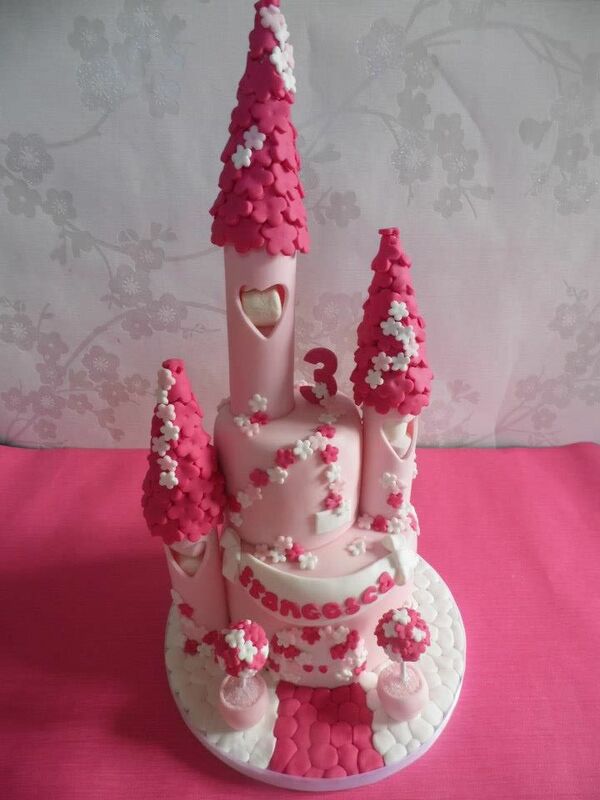 Would you like a pink princess castle with towers packed with marshmallows? 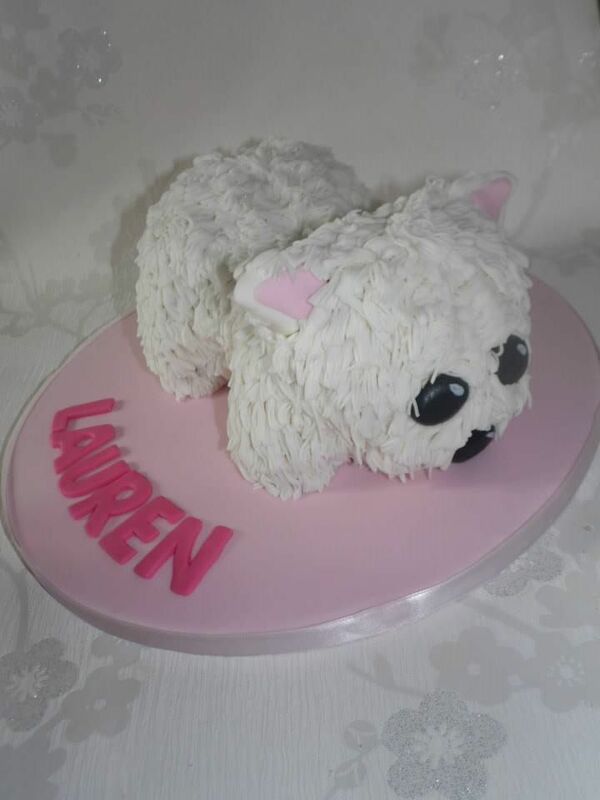 Or would you prefer a cake shaped like your gorgeous little Westie puppy? 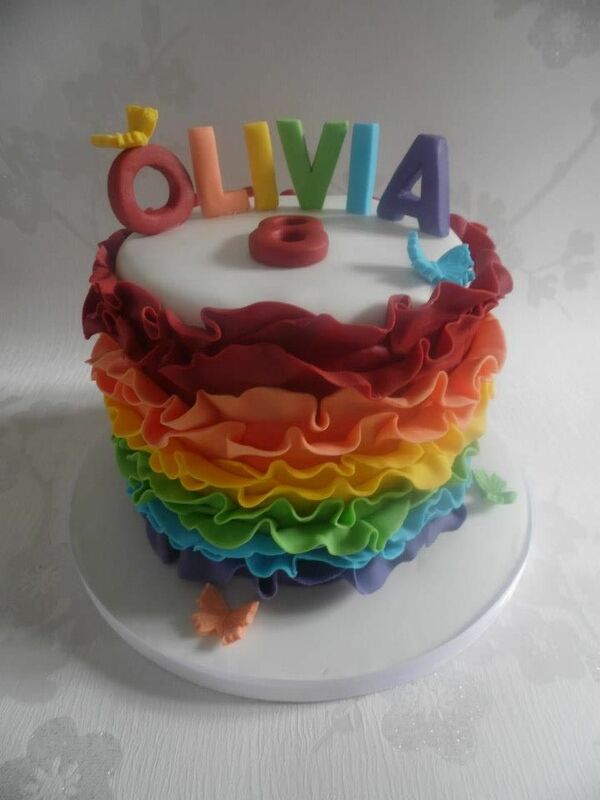 Or what about a cake with an entire rainbow inside? It’s all possible! I have to admit that when I heard that my friend was quitting her day job to start a cake baking business I was 80% thrilled and 20% nervous. I knew her cakes were something special but in a climate where we hear of failing businesses every day it would be a tough challenge. Plus, with everyone scrimping and scraping to get by, how many people would want to spend extra cash on cake of all things? Well, clearly I underestimated the appeal of exceptionally good cake and just how clever Becky is. 18 months later and Becky’s business is thriving. Her Facebook page has over 2200 likes and the orders are coming in thick and fast. Deeply impressed by her achievements I asked her if she would mind doing an interview for Red Rose Style. It was a new experience for both of us as this is my first interview. We met at Becky’s house and had a good chat whilst Becky’s eight year old son Ethan sat nearby, quietly playing, to begin with, at least! The first question I had to ask was how did Becky’s Cake Boutique start? Becky: I started in July 2012. Lots of people were telling me to do it. I didn’t really like my job at the time so I thought that I didn’t have much to lose. If it all went wrong I could always get another job. But I am doing OK.
Cathy: You have 2000 likes on Facebook, that is more than OK! Becky: Actually it’s 2290 likes now. Which is good to say it’s just been 18 months. In fact I just passed the 18 month deadline. I normally do a competition to mark the milestones but this one sneaked up on me. Cathy: I enter all the competitions but I’ve not manage to win yet! It’s very cruel! Becky: Blame the children, they pick the winners. Becky: I used to write out all the names and the children would pick the winners out of a hat but that takes too long now. So I scroll through the names and they yell for me to stop. I get hundreds of entries now and it all helps, all those shares. We get new likes with every competition and some of those people won’t bother but some might have a look at the page and place an order. Cathy: So how did you learn to bake this well? Becky: I’ve always baked. My dad taught me how to when I was little. He still bakes his own bread today. So I got it from him. 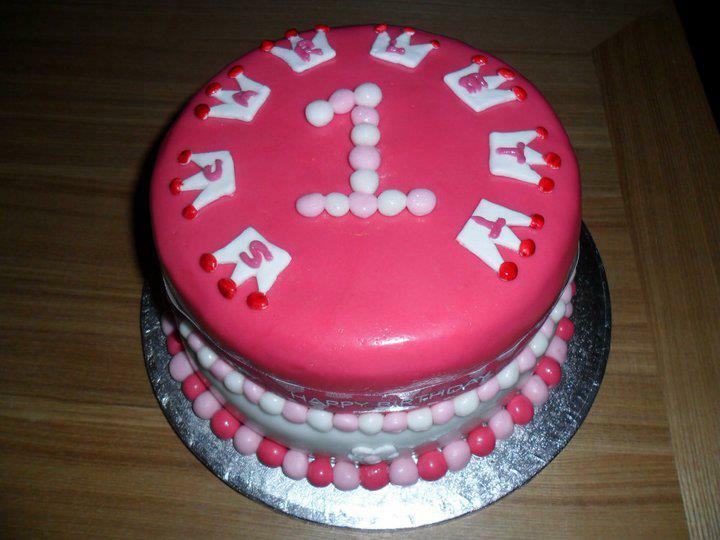 But I never decorated a cake until it was Scarlet’s first birthday . The first cake Becky ever decorated. I wanted to try and decorate a cake myself so I did some research and got hold of all the things I needed. It was a two tiered one. I just put them on top of one another. I didn’t dowel or anything. I would do them a lot differently today. I was surprised that Becky had only tried cake decorating in the last few years. You don’t have to look far on her Facebook album to be blown away by her creations. There are so many different designs and each one is personalised for the customer. I asked her if she had known that she was creative before turning to cake decorating. But I wouldn’t know where to start if I had to make up an image from scratch. I like to look things up and use them as a guide. At this point Ethan wanted to join in. 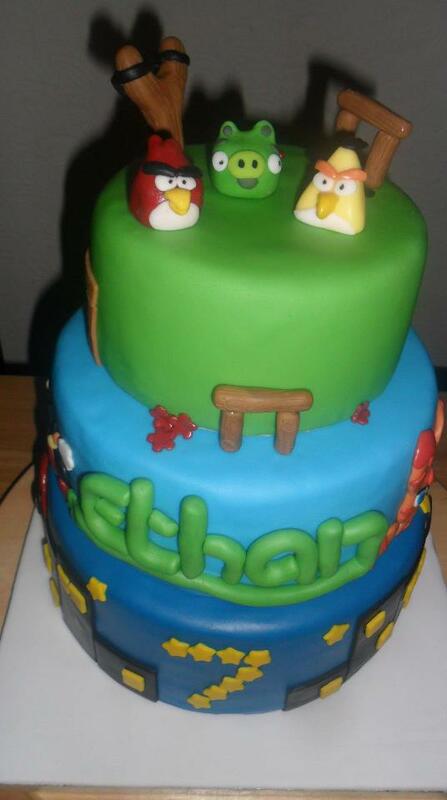 Ethan: For my birthday my mum made a three layer cake with Batman and Spiderman at the bottom, then Moshi monsters, and at the top it was angry birds! It was Yummy! Now looks are all well and good but we know what really matters about cake is the taste. And I can personally vouch that Becky’s cakes taste as good as they look. Style and substance by the truck load! She has a plethora of amazing flavours to choose from. My favourites are: Mint Aero, White Chocolate and Raspberry, Nutella, Chocolate Orange, Sticky Toffee Pudding, and Baileys! The list goes on and on and is always being updated. So I had to ask her how she keeps coming up with new flavours. 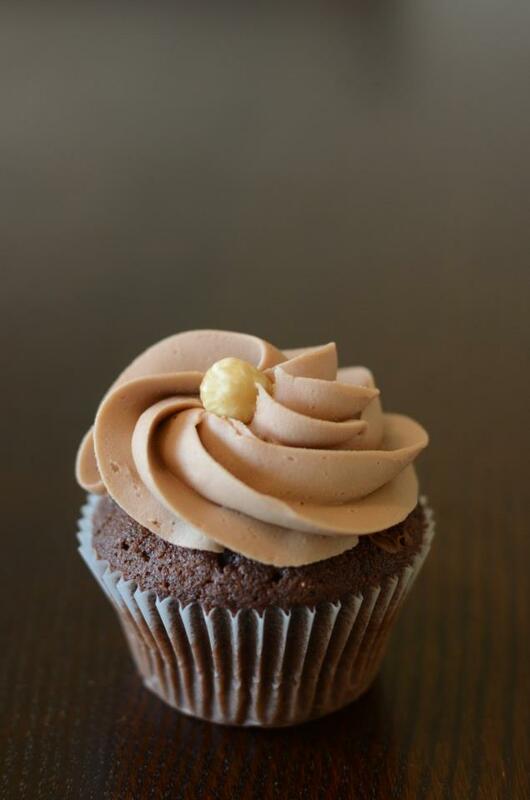 Becky: My newest one is White Chocolate Maltesers. I just saw them in a shop and thought I would try it out. It’s what I do, I just look out for new flavours to try. It helps if it is a flavour that I really like. 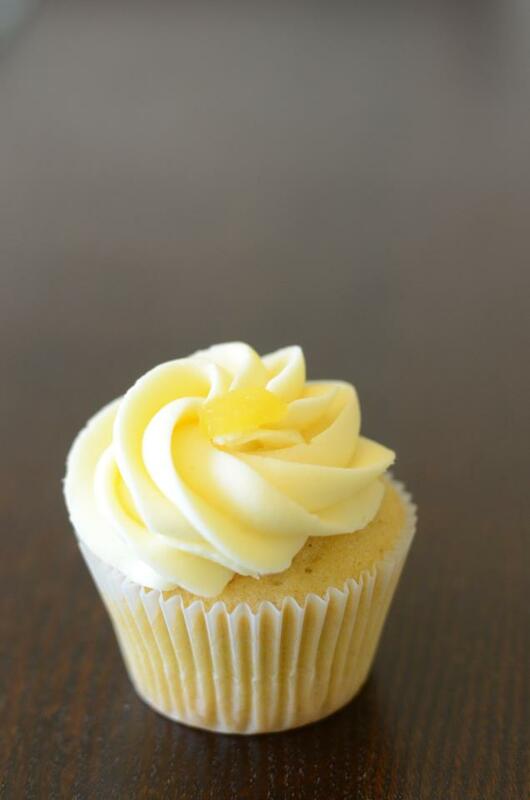 Cathy: What have been some of your favourite cakes to make? Becky: I always enjoy doing the children cakes. I think they are really fun and they use lots of colours. And I like doing the cartoon based ones, like the Minions. 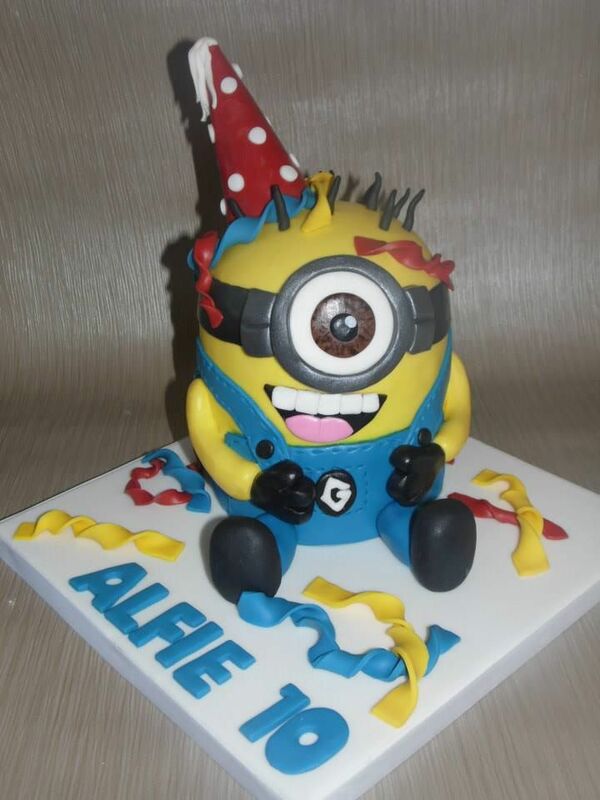 I’ve got orders for more Minion cakes coming up, one with a Liverpool top. I don’t think they are going to go out of fashion for a while. Ethan: Have you got a picture of my first Birthday cake? Becky: No, I didn’t do yours. I didn’t bake back then. Ethan (looking shocked): What? You just bought a random cake? After a pause to recover from this shocking revelation he changed track. Ethan: Have you showed her Peter’s cake? 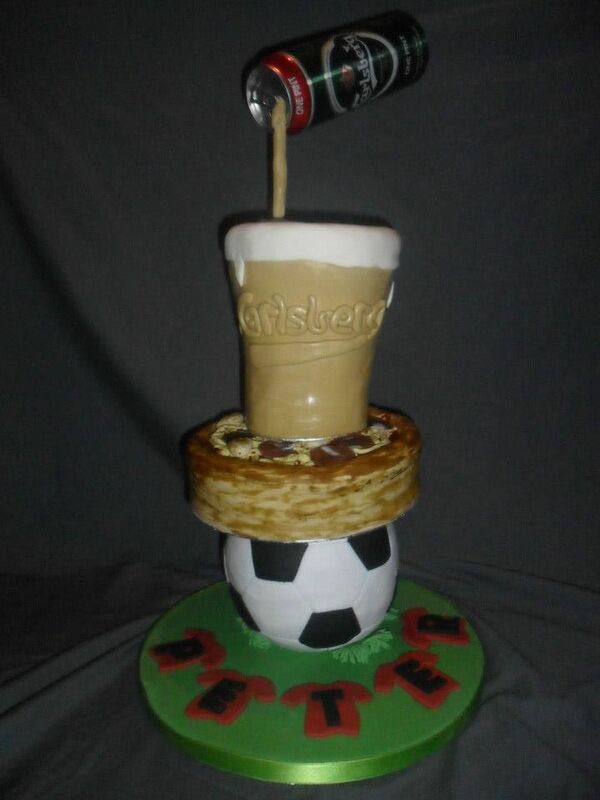 We looked at Peter’s (Becky’s husband) three tiered birthday cake which has a football base, with a pizza balanced on top with a pouring can of beer as the top layer. It is a remarkable feat of cake engineering. Ethan: I had a bit of everything. I had the cup, I had the football and the pizza. They were all delicious! Cathy: What flavours were they? Becky: They were chocolate mud cakes, one tier was white chocolate. Chocolate mud cake is sturdier and better for building with. If it was just a vanilla sponge it wouldn’t hold the shape as well. We needed to come to a close now so I asked my final question and the one I had been most curious about asking. Cathy: What advice would you give to someone who was thinking about taking their own hobby and turning it into a business? Becky: I think they should do it. Especially if it is something they enjoy. That is the best bit. It doesn’t really feel like a job because I enjoy it that much. It is hard because everything is new, especially working for yourself for the first time. You have to look everything up. Word of mouth is the best advertising. Don’t pay for advertising if you can avoid it. At the beginning I bought a page in a leaflet but I didn’t get anyone saying they had seen the advert so I don’t think that works, or it didn’t for me. But Facebook has been great! So yeah, people should do it! It was at this point that Peter yelled out ‘Becky! Disaster!’ from the kitchen. He had knocked the top off the salt shaker whilst shaking it resulting in a light dusting of salt that covered the entire kitchen. Attracted by the noise, four-year old Scarlett got out of bed and came downstairs to say that she wanted a drink, although I suspect she really just wanted to see what all the fuss was about. It seemed to be the right time to leave. I said my goodbyes and got into my car marveling at Becky’s energy to juggle the art of being a mum with her blossoming but demanding business. It occurred to me that in both roles Becky has a real fun-loving approach that shines through every one of her creations even down to the smallest cupcake. Maybe that is why they taste so good? 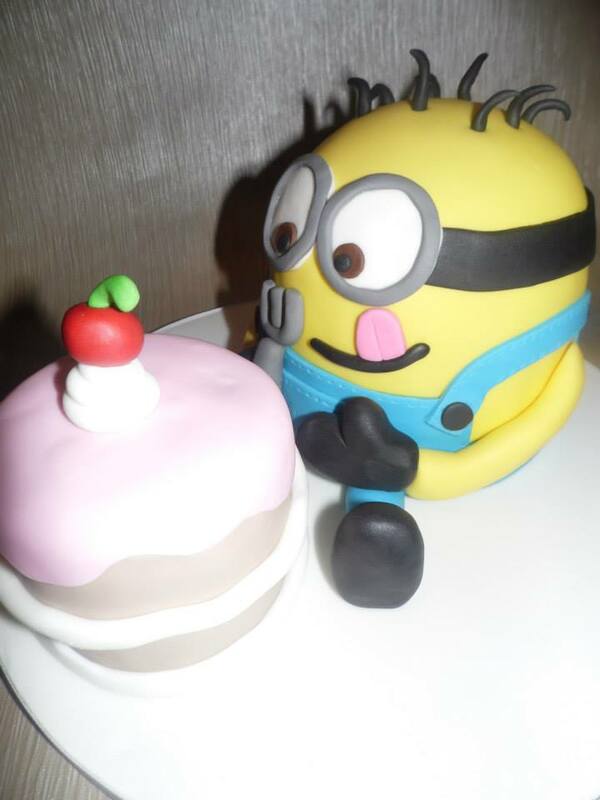 If you would like to see more of Becky’s cakes or to place an order you can check out her Facebook page here. A Victoria Sponge is meant to be the simplest cake recipe there is. It is as much as a British staple as crumpets, scones and afternoon tea. And, until yesterday, I had never made one. I used the Granny’s Victoria Sponge recipe from the BBC Food website and was delighted to see how simple the instructions were. I had everything I needed already in the kitchen except for double cream which was very easy to get. Once I had all my ingredients measured and lined up on the kitchen counter I got to work. 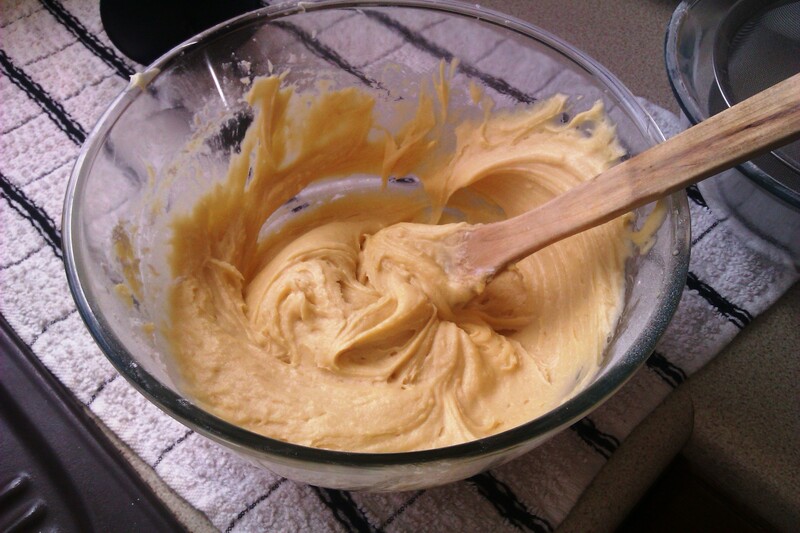 I mixed my ingredients together, using the food processor for mixing the sugar, butter and eggs. Then I folded the flour in by hand. 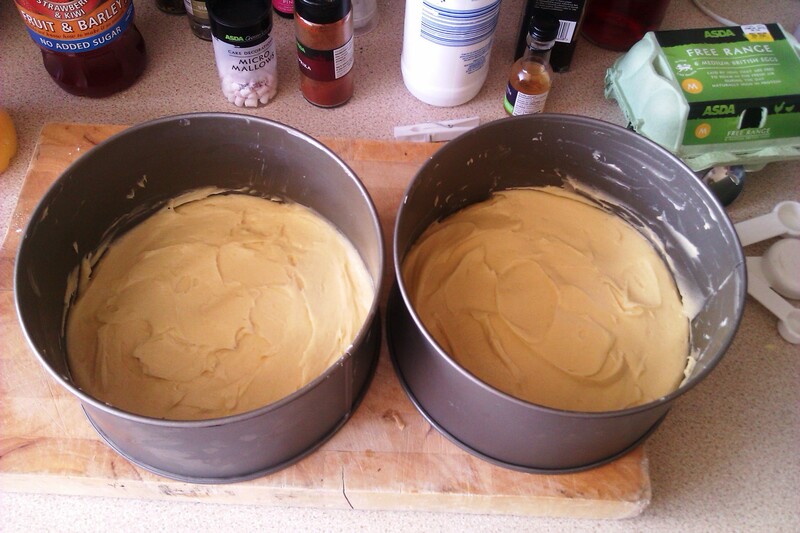 I split the mixture between these two identical cake tins and smoothed it out as much as I could. Then I placed them in the in the pre-heated oven side by side, and managed to burn my little finger at the same time. Which I was very brave about and did not whine all afternoon that my finger was sore! Once the cakes were done I pulled them out of the oven and let them cool on the counter. 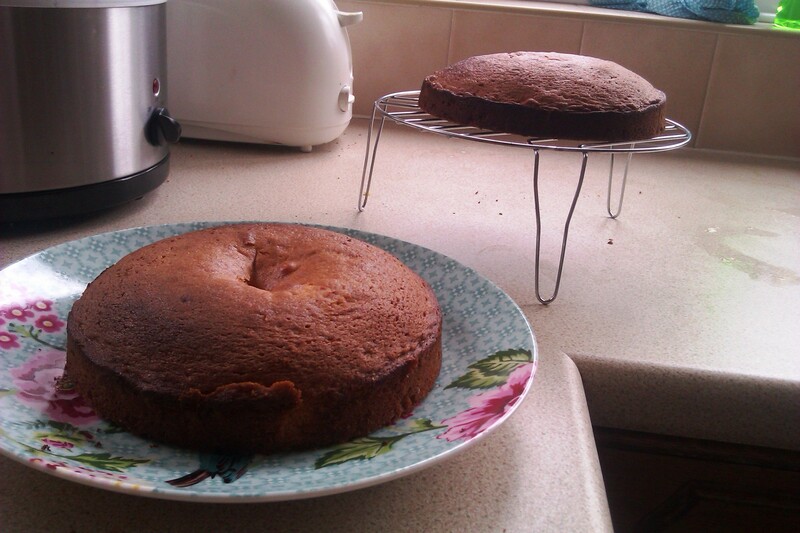 The hole on the top of the nearest cake is from when I poked it to see if it was done, before it was ready. But as that was the bottom layer I didn’t think a hole would matter. After about 20 minutes, I whipped up the double cream. 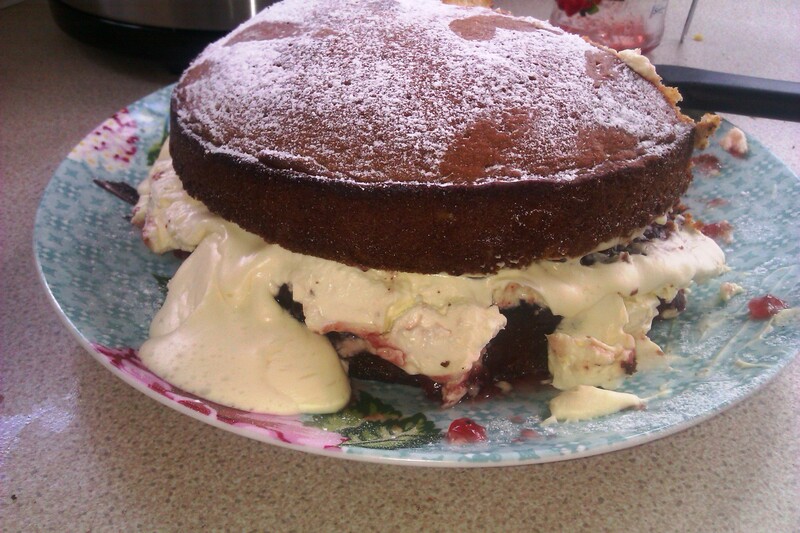 I spread a generous layer of jam on the cake, then added the cream. 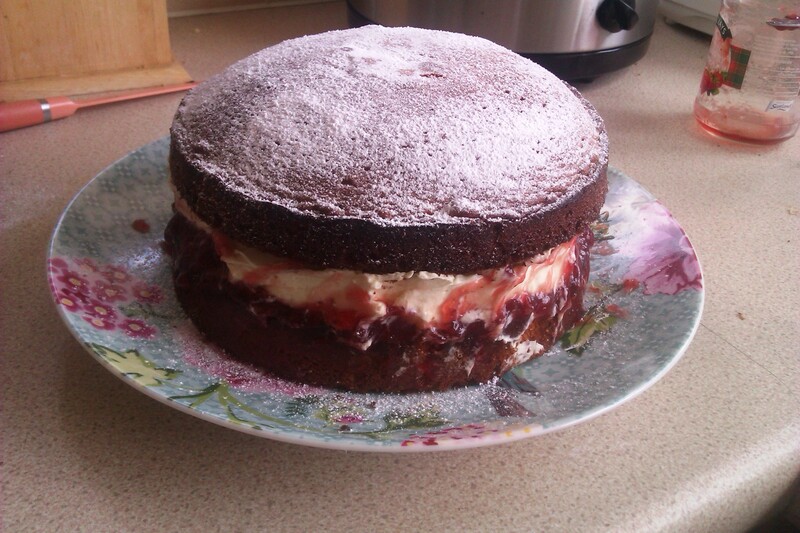 I put the top layer of the cake on and sprinkled it with icing sugar. There was some spillage around the edges which I tried to neaten up with a little spatula. I didn’t get it perfectly neat but I was still pretty pleased with the final results. I went to go locate the husband who was cleaning his bike outside and get him to come and admire my first Victoria Sponge Cake. By the time we returned to the kitchen something terrible had happened…. In my eagerness to finish the cake I had not payed enough attention to the instruction in the recipe that said to let the cake cool ‘completely’ before adding the jam and cream. Fatal mistake! Regardless of the mess, we each had a slice and the cake actually tasted pretty good. I was especially pleased with the texture and taste of the sponge which is where I normally have trouble when baking.